Once I download my email I quickly go through and, using MailTags, quickly tag my email by Project and Keywords. 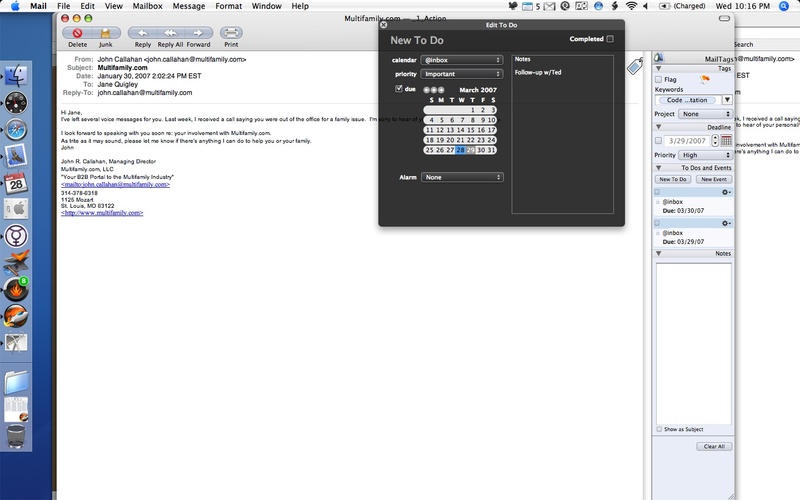 I can then assign the email as a ToDo or an Event. If it’s a ToDo, I assign it to the @Inbox calendar (which syncs to iCal on the first Actiontastic sync). After I’ve tagged each email, I use Mail Act-On to sort them quickly into folders (using rules that I’ve set up) with 2 keystrokes each. Once finished, I sync with Actiontastic, which puts anything that’s in the @Inbox calendar into the Inbox. The URL of each message is part of the message so that it can be recalled if needed. Would you mind explaining a bit more what you use the Mail Act on Rules for? By which I mean what actual rules do you create and why? I can kind of tell from the screenshot but couldn’t quite figure out what you are doing with those rules. 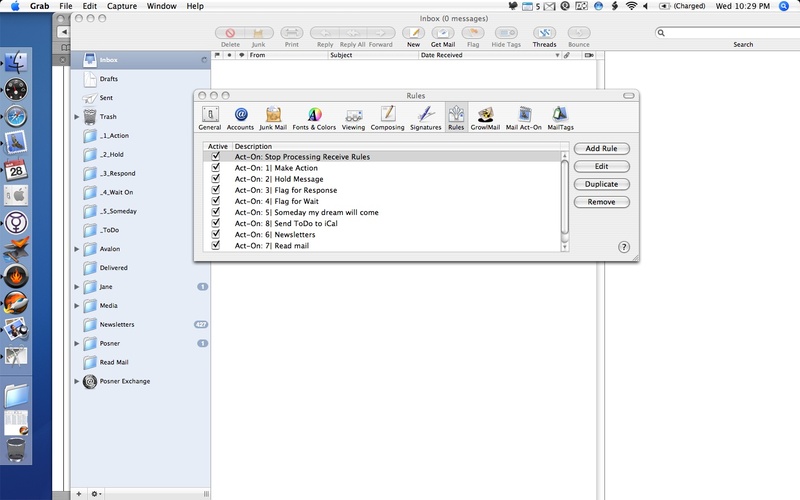 I guess I was wondering now that I think about it some more why there is a folder in Mail called actions and there is another one called todos_ical to send it to iCal and onto Actiontastic. Don’t all your actions that come from emails goto actiontastic and if so why not? I think all your other folders are for email processing but how do you write Mail Act on rules to divide them up? That seems like something that would have to be done manually. Thanks for you comments – I’ll be able to walk through this before the weekend. How about I save you some time for more important stuff in other contexts :). I did a bunch of work on GTD over the weekend and I will write up what I came up with. You gave me some good ideas and I no longer have the questions about your system that I did have. I will trackback when I write it up. Thanks John – I’m looking forward to reading your post. BTW – have you checked out iGTD? It’s a new entry into the space. I’m going to play around with it this weekend.